The Cold War was the period of protracted conflict and competition between the United States and the Soviet Union and their allies from the late 1950s until the late 1980s. The main U.S. allies were Western Europe and Japan. The main Soviet allies were Eastern Europe and (until the Sino-Soviet Split), China. Throughout the period, the rivalry was played out in multiple arenas: military coalitions, ideology; a massive conventional and nuclear arms race; and proxy wars. In 1947 the term "Cold War" was introduced by Americans Bernard Baruch and Walter Lippmann to describe emerging tensions between the two former wartime allies. There never was a major battle between the U.S. and the Soviets. But there was a half-century of military buildups, and political battles for support around the world. There also were proxy wars, such as the Korean War and the Vietnam War. Although the U.S. and the Soviet Union had been wartime allies against Nazi Germany, even before the end of the Second World War, the two sides differed on how to reconstruct the postwar world. Over the following decades, the Cold War spread outside Europe to every region of the world, as the U.S. sought " containment" of communism and forged alliances, particularly in Western Europe, the Mideast, and Southeast Asia. There were repeated crises that threatened to escalate into world wars (but never did), notably the Korean War (1950-1953), the Cuban Missile Crisis (1962), and the Vietnam War (1964-1975), but there were also periods when tension was reduced as both sides sought détente. The Cold War ended in the late 1980s with Mikhail Gorbachev's launching of his internal reform programs perestroika and glasnost and gave up power over Eastern Europe; in 1991 Soviet Union dissolved. The challenge of Nazi Germany forced the Western Allies and the Soviets into wartime cooperation. However, from the start, the alliance between the Soviet Union, the world's first Communist state; the United States, the capitalist world's leading economic power; and the United Kingdom, the world's largest colonial empire; were marked by mutual distrust and ideological tension. During the war, both sides disagreed on military tactics, especially the question of the opening of a second front against Germany in Western Europe, which Stalin had requested of the Anglo-American Allies since 1942—around two years before D-Day on June 6, 1944. The Soviets believed at the time, and charged throughout the Cold War, that the delay in opening a second front was intentional; Franklin Roosevelt and Winston Churchill, the Soviets suspected, decided to allow the Russians to bear the brunt of the war effort, leaving the Western allies the chance to intervene at the last minute to influence the peace settlement and dominate Europe themselves. 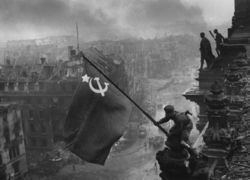 Soviet soldiers raise the glag of the Soviet Union over the Reichstag building during the Battle of Berlin on April 30, 1945. Even before the end fo the war, plans for postwar occupied Germany were the focal point of major tensions between the Western Allies and the Soviets. Following the Allied Victory in May, the Soviets effectively occupied the countries of Eastern Europe; and the U.S. occupied much of Western Europe. In occupied, Germany the U.S. and the Soviet Union—the world's two superpowers, along with France and Britain, established zones of occupation and a loose framework for four-power control. Harry S. Truman and Joseph Stalin meeting at the Potsdam Conference on July 18, 1945. From left to right, first row: Stalin, Truman, Soviet Ambassador Andrei Gromyko, Secretary of State James F. Byrnes, and Soviet Foreign Minister Vyacheslav Molotov. Second row: Truman confidant Harry Vaughan , Russian interpreter Charles Bohlen, Truman naval aide James K. Vardaman, Jr., and Charles Griffith Ross (partially obscured) . 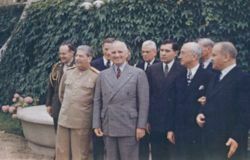 At the Potsdam Conference starting in late July, serious differences had emerged over the future development of Germany and Eastern Europe. At Potsdam, the U.S. was represented by the new president Harry S. Truman, who on April 12 succeeded to the office upon Roosevelt's death. 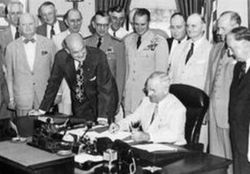 Truman was unaware of Roosevelt's plans for postwar engagement with Soviet Union, and generally uninformed about foreign policy and military matters. 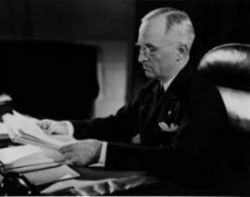 (Schmitz) Therefore, the new president was initially reliant upon a set of advisers, including Ambassador to the Soviet Union Averell Harriman, Secretary of War Henry L. Stimson, and his own choice for secretary of state, James F. Byrnes. This group tended to take a harder line toward Moscow than had Roosevelt. (Schmitz) Administration officials favoring cooperation with the Soviet Union and incorporation of socialist economies into a world trade system were marginalized. In February 1946, George F. Kennan's "Long Telegram" from Moscow helped articulate the growing hard line against the Soviets. (Schmitz) The telegram argued that the Soviet Union was motivated by both traditional Russian imperialism and by Marxist ideology; Soviet behaviour was inherently expansionist and paranoid, posing a threat to the United States and its allies. Later writing as "Mr. X" in his article "The Sources of Soviet Conduct" in Foreign Affairs (July 1947), Kennan drafted classic argument for adopting a policy of "containment" toward the Soviet Union. The event that spurred Truman into formally announcing the policy of "containment" was the British government's announcement in February 1947 that it could no longer afford to finance the Greek monarchical-military regime in its civil war against communist-led insurgents. (see Greek Civil War) Rather than viewing Britain's pullout from Greece as the related to a civil conflict revolving around domestic issues, U.S. policymakers mistakenly interpreted it as a Soviet effort; the insurgents were helped by Josip Broz Tito's Yugoslavia, not Moscow. (LaFeber 1991) Secretary of State Dean Acheson accused the Soviet Union of conspiracy against the Greek royalists in an effort to 'expand' into the Middle East, Asia, and Africa; and in March 1947, the administration unveiled the " Truman Doctrine." It "must be the policy of the United States," Truman declared, "to support free peoples who are resisting attempted subjugation by armed minorities or outside pressures." There was a slight relaxation of tensions after Stalin's death in 1953, but the Cold War in Europe remained an uneasy armed truce. U.S. troops seemed stationed indefinitely in West Germany and Soviet forces seemed indefinitely stationed throughout Eastern Europe. To counter West German rearmament, the Soviets established a formal alliance with the Eastern European Communist states termed the Warsaw Pact Treaty Organization or Warsaw Pact in 1955. (Peter Byrd) But in 1956, the status quo was briefly threatened in Hungary. In 1956, the Soviets invaded Hungary rather than allow the Hungarians to move out of their orbit. (see Hungarian Revolution of 1956) Berlin remained divided and contested. In 1961, the East Germans erected the "Berlin Wall" to prevent the movement of East Berliners into West Berlin. In the U.S., Wisconsin Senator Joseph McCarthy emerged as an influential proponent of hard-line stances on the Cold War. Although the president quietly deplored his demagoguery, the senator exploited anti-Soviet sentiment when alleging a communist conspiracy to take over the U.S. government, leading to a massive political witch-hunt. During the 1950s, the Third World was an increasingly important arena of Cold War competition. After the Second World War, the U.S. emerged as the predominat power in Third World, filling the vacuum of the old of the imperial hegemony of its principal Cold War allies—the traditional Western European colonial powers (particularly the UK, France, and the Netherlands). Nationalists in many postcolonial states, however, were often unsympathetic to the Western bloc. (Hobsbawm, 227) Adjusting to decolonization, meanwhile, was a difficult process economically and psychologically for European powers; and NATO suffered, as it included all the world's major colonial empires. During the 1950s, the U.S. and the USSR pursued nuclear rearmament and developed long-range weapons with which they could strike the territory of the other. (Peter Byrd) The Soviets developed their own hydrogen bomb and, in 1957, launched the first earth satellite. However, the period after 1956 marked by serious setbacks for the Soviet, most notably the breakdown of the Sino-Soviet alliance. (see Sino-Soviet Split) Before Khrushchev's ouster in 1964, the Soviets focused on a bitter rivalry with Mao's China for leadership of the world communist movement. Nevertheless, but both superpowers resolved to reinforce their global leadership. Both the Soviet Union and the United States struggled to stave off challenges to their leadership in their own regions. President Lyndon B. Johnson landed 22,000 troops in the Dominican Republic, citing the threat of the emergence of a Cuban-style revolution in Latin America. (see Operation Power Pack) (LaFeber 1991) In Eastern Europe, the Soviets in 1968 crushed the Prague Spring reform movement in Czechoslovakia that might have threatened to take the country out of the Warsaw Pact. Although indirect conflict between Cold War powers continued through the late 1960s and early 1970s, tensions began to ease. (Palmowski) The Chinese had sought improved relations with the U.S. in order to gain advantage over the Soviets. In February 1972, Richard Nixon traveled Beijing and met with Mao Zedong and Chou En-Lai. Nixon and and Henry Kissinger then announced a stunning rapprochement with Mao's China. 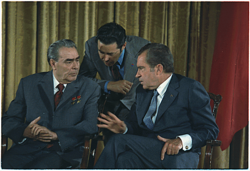 Brezhnev and Nixon talk during Brezhnev's June 1973 visit to Washington—a high-water mark in détente between the United States and the Soviet Union. Later, in June, Nixon and Kissinger met with Soviet leaders in Moscow, and announced the first of the Strategic Arms Limitation Talks), aimed at limiting to limit the development of costly antiballistic missiles and offensive nuclear missiles. (Karabell) Between 1972 and 1974, the two sides also agreed to strengthen their economic ties. (LaFeber 1991) Meanwhile, these developments coincided with the " Ostpolitik" of West German Chancellor Willy Brandt. Other agreements were concluded to stabilize the situation in Europe, culminating in the Helsinki Accords signed by the Conference on Security and Co-operation in Europe in 1975. Reagan spent $2.2 trillion for the military over eight years. Military spending, combined with the legacy of the economic structural problems of the 1970s, transformed the U.S. from the world's leading creditor in 1981 to the world's leading debtor. (LaFeber 1991) Tensions intensified in the early 1980s when Reagan installed U.S. cruise missiles in Europe and announced his experimental " Strategic Defense Initiative" to shoot down missiles in mid-flight. Reagan also imposed economic sanctions to protest the suppression of the opposition Solidarity movement in Poland. Meanwhile, the Soviets incurred high costs for their own foreign interventions. Although Brezhnev was convinced in 1979 that the Soviet war in Afghanistan would be brief, Muslim guerrillas waged a surprisingly fierce resistance against the invasion. (LaFeber, 314) The Kremlin sent nearly 100,000 troops to support its puppet regime in Afghanistan, leading many outside observers to call the war the Soviets' Vietnam. (LaFeber, 314) However, Moscow's quagmire in Afghanistan was far more disastrous for the Soviets than Vietnam had been for the Americans because the conflict coincided with a period of internal decay and domestic crisis in the Soviet system. A high U.S. State Department official outcome was predicted such an outcome as early as 1980, posting that the invasion resulted in part from a "domestic crisis within the Soviet system.... It may be that the thermodynamic law of entropy has... caught up with the Soviet system, which now seems to expend more energy on simply maintaining its equilibrium than on improving itself. We could," he construed, "be seeing a period of foreign movement at a time of internal decay." By the time Mikhail Gorbachev had ascended to power in 1985, the Soviets suffered from an economic growth rate close to zero percent, combined with a sharp fall in hard currency earnings as a result in the downward slide in world oil prices in the 1980s. (LaFaber 2002, 331-333) (Petroleum exports made up around 60 percent of country's total export earnings.) (LaFeber 2002, 332) To restructure the Soviet economy before it collapsed, Gorbachev announced an agenda of rapid reform. (see perestroika and glasnost) Reform required Gorbachev to redirect the country's resources from costly Cold War military commitments to more profitable areas in the civilian sector. As a result, Gorbachev offered major concessions on the levels of conventional forces, nuclear weapons, and policy in Eastern Europe. However, many U.S. Soviet experts and administration officials doubted that Gorbachev was serious about winding down the arms race. (LaFeber, 2002) But the new Soviet leader eventually proved more concerned about reversing the Soviet Union's deteriorating economic position than fighting the arms race with the West. (Palmowski) The Kremlin made major concessions on the levels of conventional forces, nuclear weapons, and policy in Eastern Europe; in response Reagan agreed to renew talk and agreements on economic ties and scaling back the arms race. The East-West tensions that had reached intensive new heights earlier in the decade rapidly subsided through the mid-to-late 1980s. In 1988, the Soviets officially declared that they would no longer intervene in the affairs of allied states in Eastern Europe. In 1989, Soviet forces withdrew from Afghanistan. Despite its rapid and relatively bloodless end, the Cold War was fought at a tremendous cost globally over the course of more than four decades. It cost the U.S. up to $8 trillion in military expenditures, and the lives of nearly 100,000 Americans (LaFeber 2002, 1). It even cost the Soviets a far higher share of their gross national product. In Southeast Asia, local civil wars were intensified by superpower rivalry, leaving millions dead. The end of the Cold War gave Russia the chance to cut military spending dramatically, but the adjustment was wrenching. The military-industrial sector employed at least one of every five Soviet adults. Its dismantling left millions throughout the former Soviet Union unemployed. Russian living standards have worsened overall in the post-Cold War years, although the economy has resumed growth in recent years. In the 1990s, Russia suffered an economic downturn more severe than U.S. or Germany had undergone six decades earlier in the Great Depression as it embarked on capitalist economic reforms. Many of the economic and social tensions that underpinned Cold War competition in much of the Third World remain acute. The breakdown of state control in a number of areas formerly ruled by Communist parties has also produced many new civil and ethnic conflicts. (Halliday) Both superpowers had actually begun losing control of the respective blocs since the late 1950s and, especially, in the 1970s. Today, the U.S. is challenged to make Cold War institutions under its leadership such as NATO in a post-Cold War era. In 1997, the Russia-NATO Joint Permanent Council was established to reinforce cooperation. However, nostalgia for Soviet times is pervasive in Russia, exacerbated by the economic collapse that has followed reforms aimed at dismantling the socialist economic system. (Halliday) The U.S. and Russia agreed to cooperate on after September 11, 2001 terrorist attacks, but tensions between the two powers later flared up in other areas. As an alternative ideology to Western capitalism, communism has been discredited in much of Eastern Europe, but retains influence in much of the Third World. In China, for example, the Communist Party still governs, while prioritizing economic integration with the capitalist world and eschewing its past Mao-era radicalism. Communist parties are also actively contending for power in places such as India, the Philippines, Colombia, and Nepal. The first school of interpretation to emerge in the U.S. was the "orthodox" one. For more than a decade after the end of the Second World War, few U.S. historians challenged the official U.S. interpretation of the beginnings of the Cold War. (Brinkley, 798-799) This "orthodox" school places the responsibility for the Cold War on the Soviet Union and its expansion into Eastern Europe. (Calhoun) Thomas A. Bailey, for example, argued in his 1950 America Faces Russia that the breakdown of postwar peace was the result of Soviet expansionism in the immediate postwar years. Bailey argued Stalin violated promises he had made at Yalta, imposed Soviet-dominated regimes on unwilling Eastern European populations, and conspired to spread communism throughout the world. (Brinkley, 798-799) From this view, U.S. officials were forced to respond to Soviet aggression with the Truman Doctrine, plans to contain communist subversion around the world, and the Marshall Plan. Following Williams, "revisionist" writers saw more responsibility for the breakdown of postwar peace resulting from the U.S. and cited a range of U.S. efforts to isolate and confront the Soviet Union well before the end of World War II. (Calhoun) According to Williams and later "revisionist" writers, U.S. policymakers shared an overarching concern with maintaining capitalism domestically; in order to ensure this goal, they understood an "open door" policy abroad, increasing access to foreign markets for U.S. business and agriculture would be required. (Nashel) From this perspective, a growing economy domestically went hand-in-hand with the consolidation of U.S. power internationally. The "revisionist" interpretation produced a critical reaction of its own. In a variety of ways, "post-revisionist" scholarship has challenged earlier works on the origins and course of the Cold War.